We spend Sunday afternoons getting ready for the coming week. There is something pretty satisfying in knowing at least one morning in the work week will be going smoothly. Well, as smooth as it can possibly be trying to get three kids out the door in less than an hour. One thing that I have got in the habit of is making myself a super delicious mum lunch for Monday. It gives me something to look forward to. Not that my gorgeous colleagues are not enough, but this salad. Yum. 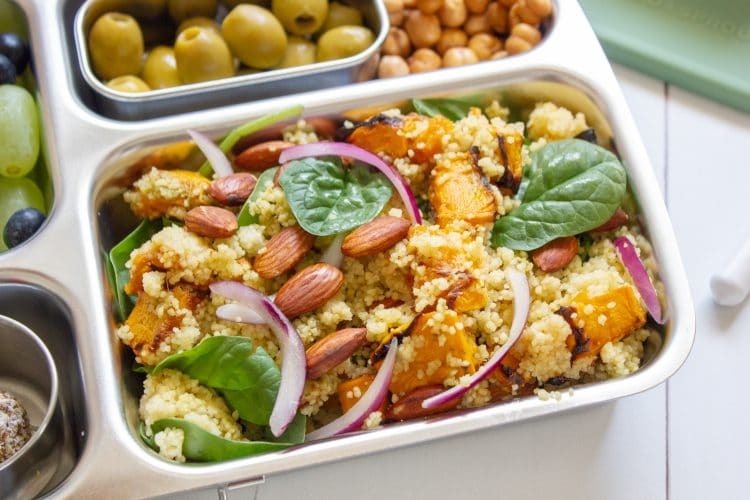 This Roasted Pumpkin and Almond Cous Cous Salad is just worth going to work for. The salad comes together quickly and it’s a truly simple recipe with very few ingredients. And it is delicious. And so filling too! This recipe makes enough for two generous serves, so you can enjoy for two work lunches, or if you are kind like me, you could share with your hubby! 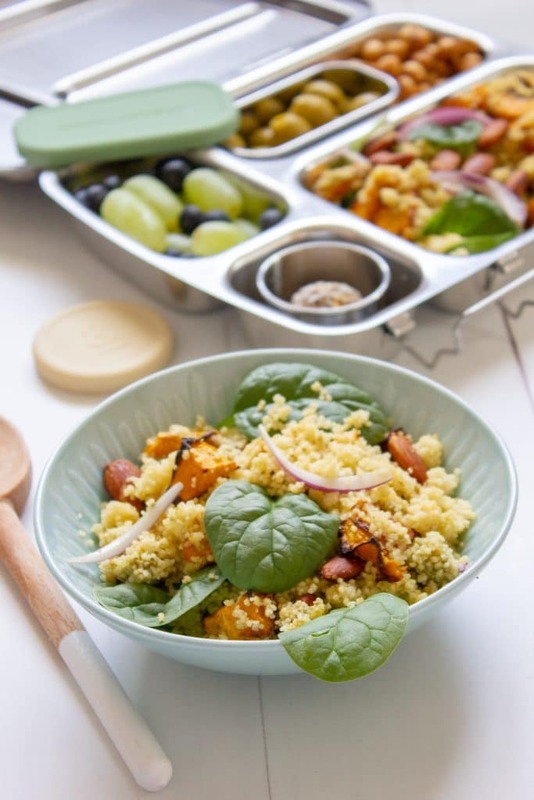 This Roasted Pumpkin and Almond Cous Cous Salad also could be served as a side with dinner or just double the recipe for a more substantial dinner. 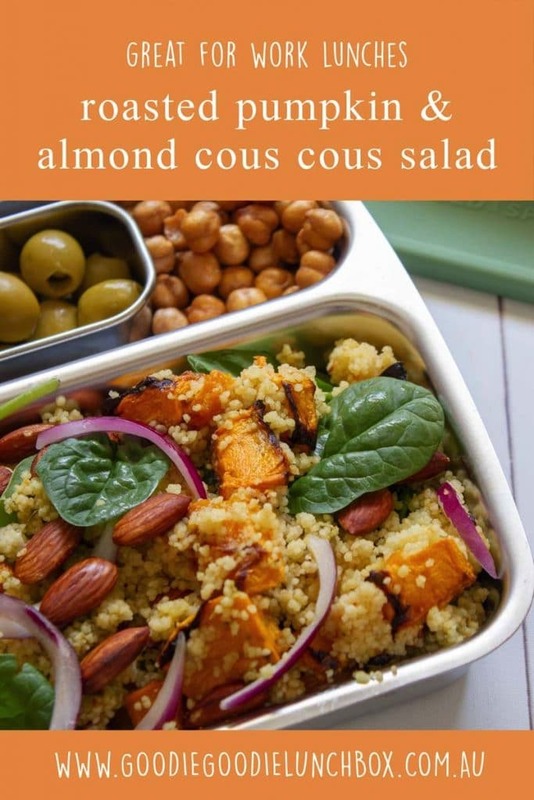 You can easily adapt this Pumpkin and Almond Cous Cous Salad too depending on your taste preferences. My husband liked adding greek yogurt with his salad and I think adding feta would work really well too. 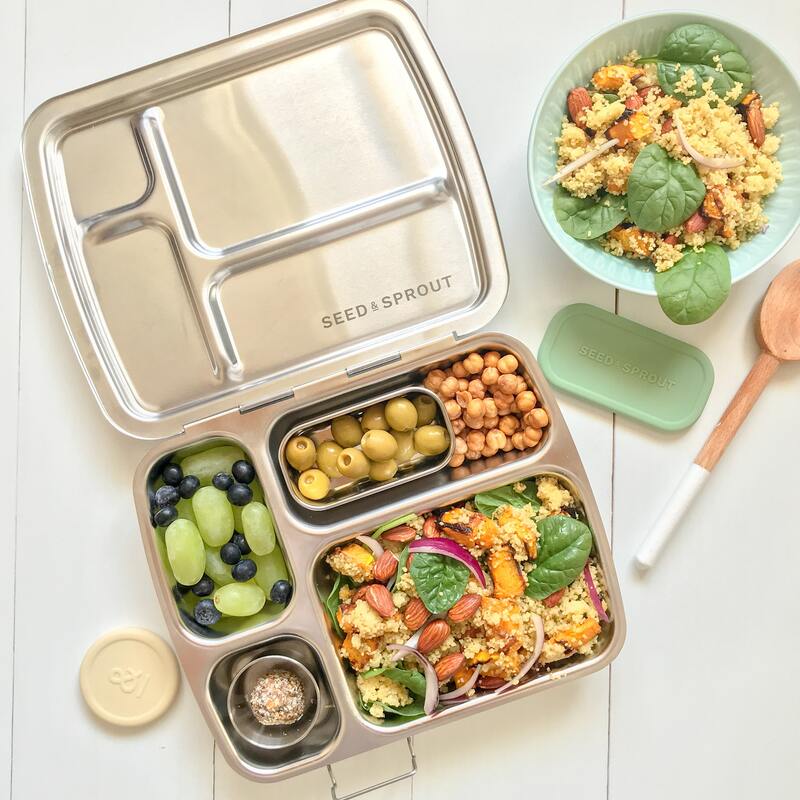 If you are vegan or if you have a dairy intolerance all you would need to do is use a dairy free pesto and this salad would be perfect as it is. 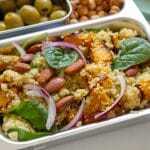 If you love packing your lunch for work too, why not try my Vegetable and Spiced Cous Cous Salad with Tzatziki or my Nourishing Roasted Vegetable Pita Pockets with Basil Pesto. 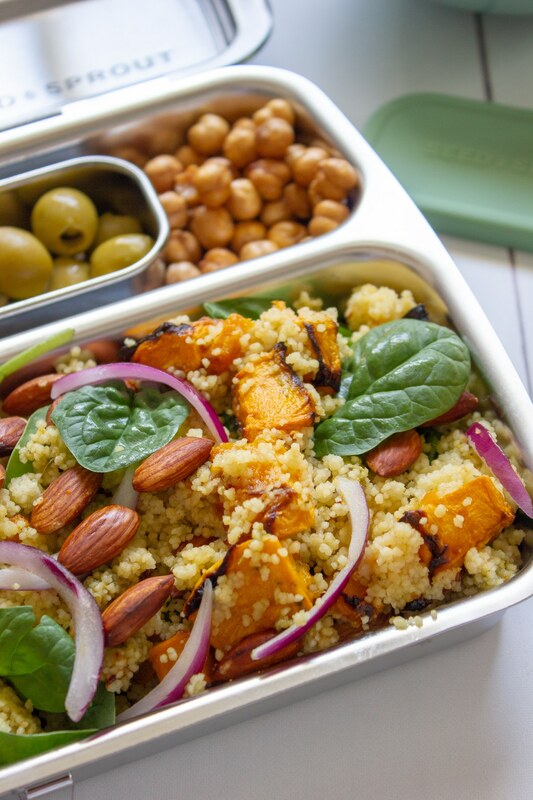 Roasted Pumpkin and Almond Cous Cous Salad is a filling, nutritious salad perfect for work lunches or with a dinner. Easily made vegan, this vegetarian meal is quick and easy and tastes delicious. Boil the required water for the cous cous on the stove top along with the vegetable stock cube and the remaining 1/2 clove of garlic and prepare the cous cous according to the packet instructions then set aside to cool. 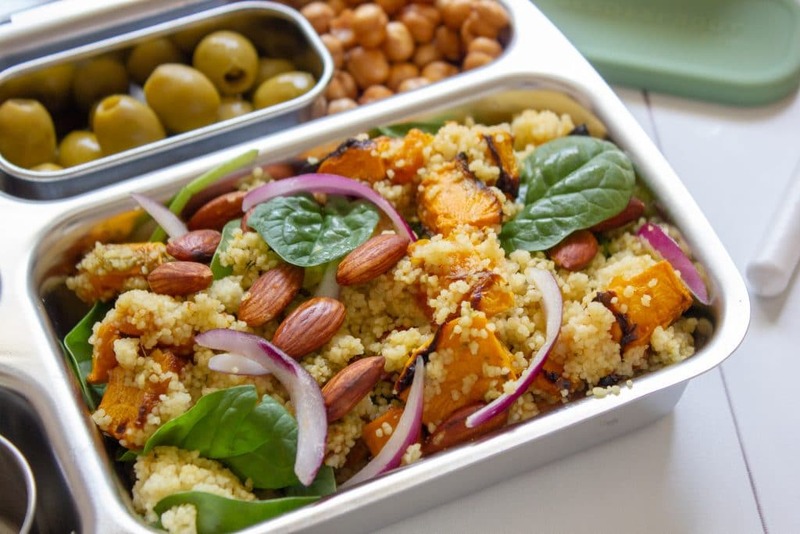 I hope that you enjoy this simple Roasted Pumpkin and Almond Cous Cous Salad. Remember if you make my recipes to take a quick pic and share with me on Facebook or Instagram! Love the idea,Thanks for sharing such an amazing recipes..